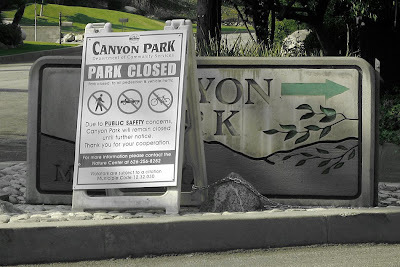 Due to the Azusa (Morris) fire, Canyon Park has been temporarily closed - even to pedestrians. Be sure to call the park first at 626-256-8282 to check whether the park is open or still closed before heading up. UPDATE 8/26/2009: Due to the fire, the Biodiversity Fair scheduled for this weekend in Monrovia Canyon Park has been canceled. Pas Adj: Just updated post with more bad news.